Mobile phones now do so much more than simply make calls that many of us would be completely lost without them. Unfortunately thousands of phones do go missing each year and many of these will have been stolen. But if your phone does go missing you could be left with a much bigger headache than simply having to replace your handset. Not only are many smartphones worth hundreds of pounds, but thieves can quickly rack up huge bills on stolen phones. You may be liable for all charges run up on your phone when it goes missing up until you report it as lost or stolen to your provider. Therefore, it's important you contact your provider as soon as possible to avoid facing high charges as a result of unauthorised use. If your phone goes missing and you are with Three, Virgin Mobile, Vodafone, EE or O2 for mobile services, you should only be responsible for paying up to a maximum of £100 for any unauthorised usage outside of your allowance- if you report your phone as missing within 24 hours. Always treat your phone as carefully as you would your bank or credit cards. 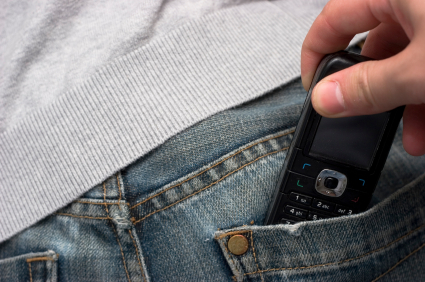 Take care when using your phone in public, don't let it out of your possession. Make sure you put a passcode on both your handset and SIM to make it more difficult for thieves to use. Make a record of your phone's IMEI number, as well as the make and model number. The IMEI is a unique 15-digit serial number which you will need to get the phone blocked. You can get your IMEI number by keying *#06# into your handset or by looking behind your phone battery. Consider barring calls to international and premium rate numbers to limit the usefulness of your phone to thieves. Some mobile insurance policies may provide some cover for unauthorised use so it is worth checking the terms and conditions of your existing policy, or when considering a new policy. You can download an app which can trace your phone if it is lost/stolen and can enable you to wipe details from it remotely - such as findmyiphone and Android device manager. Register your phone with Immobilise, a database which helps the Police to identify the owners of property, such as phones, that they recover. Ofcom's guide on keeping your smartphone secure and the National Mobile Phone Crime Unit are also useful sources of advice on how you can protect yourself from becoming a victim of phone crime. Contact your provider as soon as possible, try to do this within 24 hours. Your provider can then bar your SIM to stop calls being made on your account. Your provider can also stop anyone else from using your phone by blocking its IMEI. Remember, if you have mobile phone insurance, you may need to let them know within a certain time frame too. If you want to switch to a different provider but keep your existing handset, you may need to get your phone unlocked. This guide shows you how to unlock a phone. Here you'll find the four different ways in which safety and security are executed.